Would you like easily get hooked on some roaring natural wonders? Among various Sri Lanka’s beautiful waterfalls with their lofty heights and stunning powers, Bakers Waterfall is one of attractive roaring natural wonder. Within the Horton Plains National Park, Nuwara Eliya in Sri Lanka, this amazing nature creation is located. British explorer Sir Samuel Baker accused by finding and naming this Bakers Waterfall. It is said that Sir Samuel had found this beautiful waterfall whilst he was trying to establish an agricultural settlement around that area. The Bakers Waterfall plunges 22 meters into the gorge below. To view the monstrously loud and the mist rising of this fall, visitors have to trek about 03 km from the Horton Plains National Park Information Center at its entrance. 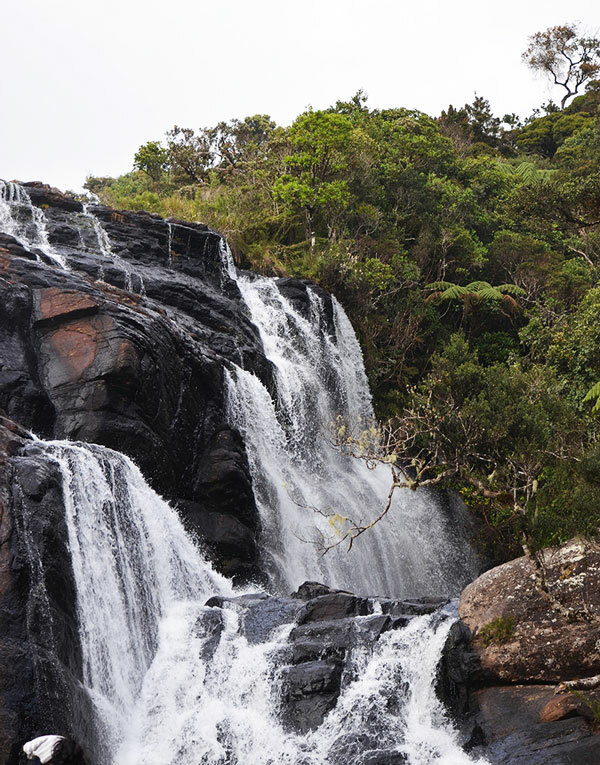 Or, visitors should select the right fork at the start of the World’s End path of Horton Plains National Park, to head reach this beautiful waterfall. Not only the waterfall, but also the footpath towards the Bakers Waterfall is also attracting her visitors by the eco experience. Visitors lose themselves in cold, misty and grassy plains by passing a number of serene brooks and streams along the way. Travelers can enjoy several picturesque views near this fall. Her fallings over a wide rock into a valley covered with attractive and beautiful wild flowers such as Rhododendrons, Orchids and plentiful giant Fern bushes is one of breath-stealing views of Bakers Waterfall. Do you want to refresh and stimulate your mind, body and soul with a gentle sound of a waterfall? If so, this Bakers Waterfall will be one of your favorite travel destinations. This attractive Bakers Waterfall begins with a long pool which flows over, splitting into thousands of various streams. Halfway down, it creates the second smaller falls of Bakers Waterfall. These white curtains of water flow over three heights of smooth rock before plunging into the gorge below, is a magnificent view of nature creations. Therefore, travelers who wish to feel the power of the planet's mightiest and most beautiful waterfalls, Bakers Waterfall in Sri Lanka will be a best travel destination. Would you like to view and enjoy any other amazing waterfalls in Sri Lanka? Bambarakanda Waterfall, Devon Waterfall, St Clairs Waterfall and Diyaluma Waterfall are some of them. And there is wide range of eco-friendly affordable and best Nuwara Eliya hotels and Ratnapura Hotels available, out of endless selection of Hotels in Sri Lanka. Thus, it’s time to get hooked easily on one of roaring natural wonders; Bakers Waterfall!